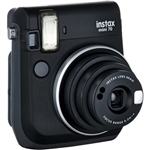 The FujiFilm Instax Camera System, featuring Fuji Instax Film. Obtain high-quality prints almost instantly! 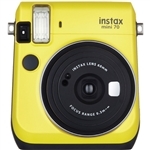 With its rounded shape, easy-to-hold side grip, and fingertip controllable composite control panel, the Instax 210 uses the Fujifilm ISO 800 instant film to offer vivid, high-quality prints almost instantly. Its automatically-adjusting flash, high-resolution retracting lens and big clear viewfinder add up to unsurpassed performance. It is great for home use, outdoors, family occasions, modeling agencies, event marketers, summer camps, insurance, real estate, and much more. The focus free lens is great for shots as close as 0.9' and the Auto flash is great for pictures in any light. 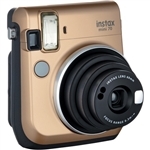 Combined with the use of the Instax film which carries a rating of ISO 800, this camera comes in very handy in low light scenarios. 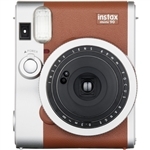 The Fujifilm Instax System offers an appealing alternative to previous users of Polaroid cameras utilizing Polaroid Type 600 Films.